During the week of 14th May 2018 Mark and Richard from Maydencroft removed all the rocks from the large Central Planting bed, then re-shaped and re-profiled it, before edging it with large stones. James and Im0gen finished it off by bedding the edging rocks with soil so that they looked as though they had always been there. Ann MacDonald decided to cover the Central Bed with a weed suppressing membrane and on 18th May with Sarah and Andrew, they spent a couple of Happy Hours at Rochfords Nurseries selecting plants. It took three trips to transport all the plants back to the Fernery. Some plants were planted straight away. Early on Saturday morning 19th May the first of a two day planting session started. After Sarah had marked out where each specific plant should go, the Fernery Gardening Group swung into action. Generous watering took place before the task was completed and the process was repeated on Monday morning 21st May 2018. 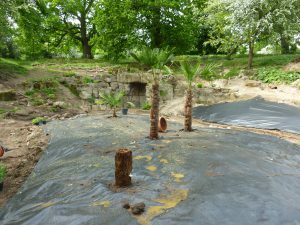 Hopefully, before 17th June 2018 Open Day, a mulch of bark chip and compost will be spread all over the bed to complete the job. All the plants will be added to The Planting Record in due course. 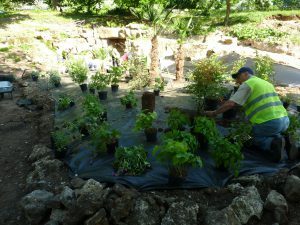 We have a great deal of work to do preparing the Fernery for the Open Day on Sunday afternoon 17th June, and it has been decided that we will continue to meet on each Thursday between now and 17th June, but for light duties only. We will clear and rake pathways, undertake weeding, watering, and tidying of formal flower beds. As the weed killers take more effect, we will start strimming the grassy banks. Between now and the 17th June, we will meet on each Thursday. Apart from the extra Thursday meetings, members will be meeting up on mutually agreed evenings to continue watering, weeding and other light duties. If you have WhatsApp installed on your mobile phone, please send a WhatsApp message to the Administrator John Roper on 07910 311589 asking to participate. Use WhatsApp to let others know on which dates you could be available. We are busy planning jobs and responsibilities for the Open Day, so if you have not yet offered your services please give Andrew a call and see how you might be able to contribute. We shall certainly expect most of you on site on the Open Day, wearing your hi-viz jackets, and ready to help act as marshalls to show visitors around the site in a safe manner. Harry and Andrew are also making plans to erect at least two tents one of which, a gazebo, will be at the entrance for the reception, and a larger marquee near the field gate which will act as a Refreshments Tent. They are sure to value your offer to help set those up as they cannot be erected until the morning of the Open Day, and there is little time to get everything done and ready. We were short last year of casual chairs and tables, and as we plan for good weather again, we will value your offer of chairs and tables in good time, so that arrangements can be made to collect them and return them on the day. Hilary is busy drawing up a list of things, and help, she will need to stock and sell at the Refreshments Tent: we will be offering Victorian cakes and drinks. We hope to get a new print of our Information Leaflet to the printers within two weeks. In format terms, it will appear very similar to the 2017 version with the benefit of having wording which was approved by Ann. If you can help, and have not yet been approached, please contact any one of the Committee team whose contact details are on our website. N.B. Contact details of all the Committee members are on the website. If you can think of other matters that might appropriately be included please share your thoughts with the team, and if we reach agreement I will add more details to the website Notice. 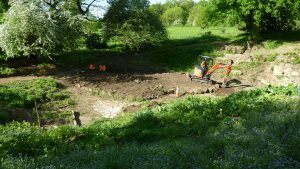 As we stated two months ago, to prepare for the Open Day on Sunday 17th June, Garden Restoration now takes priority over excavation work except, of course, mechanical excavation work carried out by Maydencroft to an agreed plan. After several postponements, and with the arrival of better weather, the Borough Council granted us two weeks access to Maydencroft’s skilled team of mechanical digger operatives, starting last Wednesday. Mark was in the chair assisted by Richard. 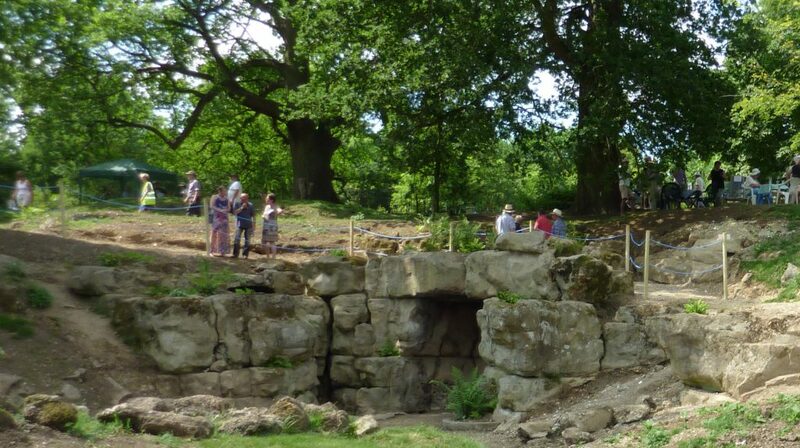 Benefitting from constructive thought and planning, Maydencroft’s intervention has in just three days led to an amazing amount of new excavations and discoveries. 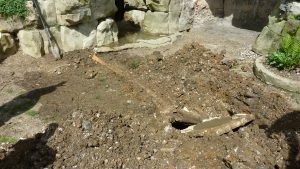 On Wednesday we discovered a huge soak-away in front of the grotto, to take water away from the basin at the foot of the dropping well. 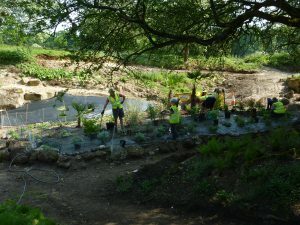 And on Wednesday a third tier was discovered beneath the two-tiered planting bed on the East side of the dell. 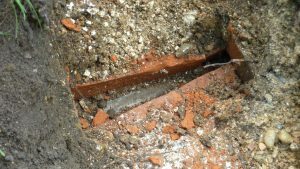 On Thursday an electrical trace attached to the lead water pipe in the dropping well revealed that underground lead piping is feeding from the direction of the House all around the dell. 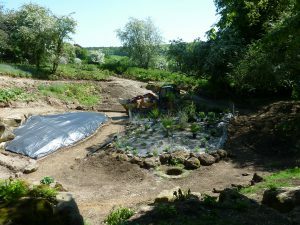 On Thursday the large central bed was cleared of rocks, and re-profiled. 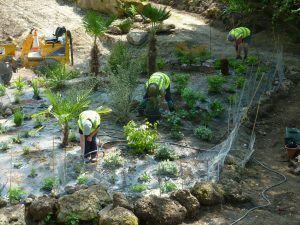 On Friday the rocks were placed around the edges of the newly profiled central bed and made to look ‘original’ through meticulous soil packing by Maydencroft’s James and Immogen. Also on Friday the bed by the retaining wall was cleared and re-profiled. The good news here was that we proved that this is yet another of Anthony Parson’s special ‘tanked’ beds with a concrete base and a drainage hole. The disappointment was to discover that the red-brick wall at the front edge has, over the years, been robbed and is likely to be 3-4 courses too low. On Friday all the grass beds had a second spray of selective weed killers. 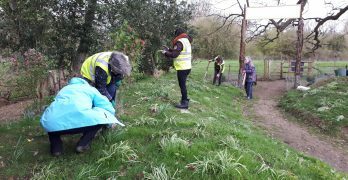 TASK 1 – Continue nettle weeding in the prepared planting beds. 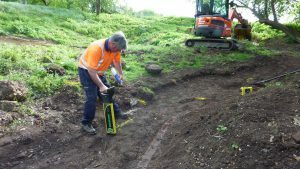 TASK 4 – Clearing, scrubbing and cleaning the Rock edging on the sloping North East path past the Pulhamite outcrop. 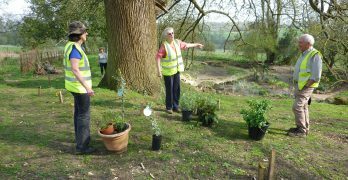 TASK 1 – Plants will be selected and purchased from Rochfords by Sarah and Ann, supported by Andrew. TASK 3 – Sarah will place the plants – after placement assistance will be required. Will all volunteers who would agree to attend ad hoc gardening meetings (for example, see above meetings on 19th and 21st May) please send a WhatsApp message to John Roper so that you can opt-in to the WhatsApp FERNERY GARDENING GROUP which was recently established. The purpose of this Group is solely to facilitate short term communications to arrange such meetings. 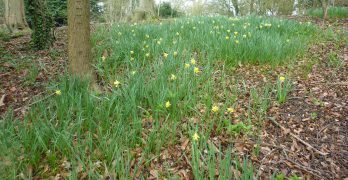 We will meet at 10 am at The Fernery on Thursday 17th May 2018. The leaders will expect to be on site from 9.30 onwards to get the tools ready, so if you are an ‘early bird’ and can help, please do so.